Anthony Kniffen's first professional orchestral experience, at age 18, was playing Principal Tuba in the Chicago Symphony Orchestra under the baton of Georg Solti as part of their tuba audition process in 1988. A year later he joined the Honolulu Symphony Orchestra and was subsequently appointed Principal Tuba of the Indianapolis Symphony Orchestra in September 1997. His teachers have included Daniel Perantoni and Harvey Phillips, both at Indiana University, Gene Pokorny and Arnold Jacobs of the Chicago Symphony, and Robert Tucci, of the Bavarian State Opera Orchestra and Floyd Cooley, of the San Francisco Symphony. Playing along with such diverse groups as folk artist as the Makaha Sons of Ni’ihau in Hawaii to the Buselli-Wallarab Jazz Orchestra here in Indianapolis, Mr. Kniffen has also performed with the Saint Louis, Minnesota, Detroit and New Mexico symphony orchestras and recorded numerous discs with the Cincinnati Symphony Orchestra. He has toured extensively the United States with Summit Brass and in Japan with Sierra Brass. He has won four concerto competitions and appeared as soloist with the Honolulu and Indianapolis Symphony Orchestras. Other solo appearances include regional and international tuba conferences and colleges, including his alma mater, Indiana University. A highlight of Mr. Kniffen's career was performing the John Williams Tuba Concerto on an ISO Classical Series Concert under the baton of Mario Venzago in February of 2008. 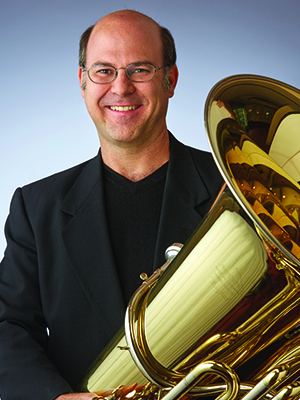 Mr. Kniffen is the ‘play-along’ tuba player on a Hal Leonard educational project called, “Essential Elements 2000," and can also be heard on a tribute CD to jazz legend David Baker, "Basically Baker" (volume one), and on "CSO Resound: The Chicago Symphony Orchestra Brass Section Live." His teaching career began at the University of Hawai'i and for a time here at the University of Indianapolis. A great honor has been to fill in for sabbaticals at the University of Cincinnati College-Conservatory of Music, Ball State University, and several times for his mentor, Dan Peranatoni at IU. Mr. Kniffen was recently appointed Instructor of Tuba at Butler University. He is devoted to his lovely wife, ISO violist Amy Kniffen, their children, and their church, and is proud of having recently (almost) completely remodeled their masterbathroom mostly by himself learning from Youtube videos.